The Rupes LHR 15ES Big Foot Random Orbital Polisher Deluxe Kit includes the complete lineup of the Rupes' engineered Big Foot system. Rupes designed their system from the ground up. The components are designed to complement each other while taking full advantage of the Rupes LHR 15ES Big Foot Random Orbital Polisher's powerful oscillating action. What this means is that you have everything you need to remove deep paint imperfections, minor scratches, acid rain damage, wet sanding marks, bug stains, swirl marks or towel marks and to burnish the finish to a high gloss. The Rupes LHR 15ES Big Foot Random Orbital Polisher features a large 15 mm stroke. Dual-action random orbital polishers move their pads in an orbital motion around a center axis point (oscillation). The stroke refers to the diameter of each oscillation. Most DA orbital polishers feature a stroke that is between 4 and 8 mm. Increasing the stroke changes the dynamic forces that affect the polishing pads and ultimately the polishes themselves. The Rupes Big Foot system is engineered to elicit the highest performance possible from large stroke Random Orbital Polishers. Each component of the Big Foot system is included in the Rupes LHR 15ES Big Foot Random Orbital Polisher Deluxe Kit. The Rupes LHR 15ES Big Foot Random Orbital Polisher uses a large 15 millimeter stroke and efficient 500 watt motor to quickly eliminate paint defects. Because the Rupes LHR 15ES Big Foot is a dual-action orbital polisher, it is safe for users of all levels of experience. Even novices can achieve expert results with minimal experience. Rupes specifically engineered the components of the Rupes Big Foot system to work together to give you incredible results and an extremely smooth buffing cycle. 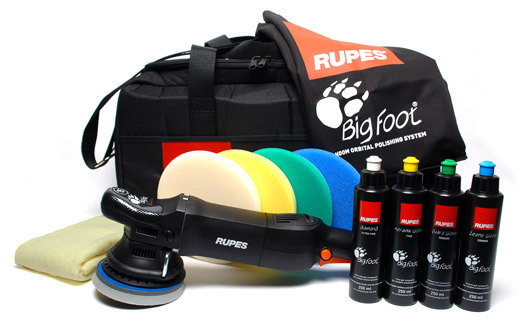 The Rupes Big Foot Polisher Bag easily holds all of the components in this kit with room to spare! The body and lid are made from nylon canvas that has been sewn together with reinforced seams. The center section will hold your Rupes LHR 15ES Big Foot polisher and secure it with a center strap. Individual internal pockets hold the complete range of Rupes Polishes while large pockets secure the Rupes Foam Pads. This solidly constructed detailing apron is made of soft polyester which will not scratch or damage your paint work. The Rupes Big Foot Detailing Apron also protects your clothing from polish splatter stains. The lightweight Rupes Big Foot Detailing Apron features a neck loop and waist string to fit comfortably over your clothing. Rupes Zephir Gloss Coarse Gel is designed to work in conjunction with Rupes Blue Coarse Foam Pads in order to eliminate severe paint defects such as oxidation, deep scratches and P1500 grade sanding marks. For best results follow up with Rupes Keramik Gloss Fine Gel Polish or Rupes Diamond Ultra Fine Gel Polish with an appropriate pad. Rupes Quarz Gloss Medium Gel Compound works with the Rupes Green Medium Foam Pad to remove moderate paint defects like car wash brush scratches, deep swirl marks and general weathering. It is even capable of eliminating P2500 grade sanding scratches on fresh paints. For best results follow up with Rupes Keramik Gloss Fine Gel Polish or Rupes Diamond Ultra Fine Gel Polish with an appropriate pad. Rupes Keramik Gloss Fine Gel Polish is designed to work with the Rupes Yellow Polishing Foam Pad to remove buffer swirls, haze and light wash marks. This polish and pad combination strikes a fine balance between polishing power and finishing ability, making it ideal for one-step and maintenance polishing. It will leave most paint colors and finishes with an exceptional gloss and a haze-free finish. If you demand the highest gloss finish possible then Rupes Diamond Ultra Fine Gel Polish is for you. Designed to work with Rupes White Finishing Foam Pad, this polish is designed to smooth away the faintest marks and burnish the paint to an absolutely perfect shine. Use this polish and pad combination prior to waxing or sealing the paint to maximize clarity and gloss. The Rupes Blue Coarse Foam Pad is an open celled foam compounding pad that is designed for maximum polishing action. Use this pad with Rupes Zephir Gloss Coarse Gel Compound on a Rupes LHR 15ES Big Foot Random Orbital Polisher to eliminate severe paint defects such as acid rain marks, oxidation, deep scratches, and 1500 grit wet sanding marks. The Rupes Green Medium Foam Pad is an open celled foam light compounding pad that is designed to balance polishing action and finishing ability. Use this pad with Rupes Quarz Gloss Medium Gel Compound on a Rupes LHR 15ES Big Foot Random Orbital Polisher to polish away medium paint defects such as brush marks from car washes, medium scratches, oxidation and weathering. The Rupes Yellow Polishing Foam is a tightly packed open cell foam pad designed to smooth away paint imperfections without creating visible scratches. Use this pad with Rupes Keramik Gloss Fine Gel Polish on a Rupes LHR 15ES Big Foot Random Orbital Polisher to level fine paint defects such as towel marks or to remove heavy buffer holograms. The Rupes White Finishing Foam Pad is a soft, open celled foam finishing pad that is non-abrasive to the paint but firm enough to withstand the large stroke of the Rupes Big Foot LHR 15ES Big Foot Random Orbital Polisher. Use this pad on the aforementioned polisher with Rupes Diamond Ultra Fine Gel Polish to burnish the paint to a mirror-like shine. Always dial in your polishing technique by polishing a test spot first. Start with the least aggressive method such as the Rupes White Finishing Pad & Rupes Diamond Ultra Fine Gel Polish. If swirl marks or damage are still visible increase the polishing action by switching to the next pad & polish combination until the desired results are achieved. Microfiber detailing cloth A total retail value of $737.00. You save $157.01!